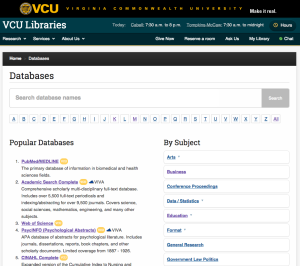 Today VCU Libraries launched a couple of new web tools that should make it easier for people to find or discover our library’s databases and research guides. This project’s goal was to help connect “hunters” to known databases and help “gatherers” explore new topic areas in databases and research guides1. Our web redesign task force identified these issues in 2012 user research. Since the dawn of library-web time, visitors to our databases landing page were presented with an A to Z list of hundreds of databases with a list of subject categories tucked away in the sidebar. 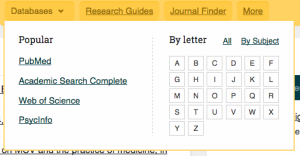 And, on database subject pages and database search results, there are links to related research guides. Building on the search feature in the new database list, we created an AJAX Google Adwords-esque add-on to our search engine (Ex Libris’ Primo) that recommends databases or research guides results based on the search query. For longer, more complex queries, no suggestions are shown. To highlight the changes to the databases page, we also made some changes to how we are linking to it. Previously, our homepage search box linked to popular databases, the alphabet characters A through Z, our subject list, and “all”. The intent of the new design is to surface the new databases list landing page and wean users off the A-Z interaction pattern in lieu of search. 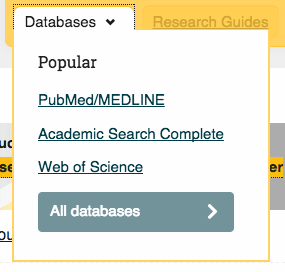 The top three databases are still on the list both for easy access and to provide “information scent” to clue beginner researchers in on what a database might be. Dropping the A-Z links will require advanced researchers to make a change in their interaction patterns, but it could also mean that they’re able to get to their favorite databases more easily (and possibly unearth new databases they didn’t know about). Research guides search is just okay. The results are helpful a majority of the time and wildly nonsensical the rest of the time. And, this search is slowing down the overall load time for suggested results. The jury is still out on whether we’ll keep this search around. Our database subject categories need work, and we need to figure out how research guides and database categories should relate to each other. They don’t connect right now. We don’t know if people will actually use the suggested search results and are not sure how to define success. We are tracking the number of clicks on these links using Google Analytics event tracking – but what’s good? How do we know to keep this system around? The change away from the A-Z link list will be disruptive for many and was not universally popular among our librarians. Ultimately it should be faster for “hunters”, but we will likely hear groans. The database title search doesn’t yet account for common and understandable misspellings2 of database names, which we hope to rectify in the future with alternate titles in the metadata. Shariq Torres, our web engineer, provided the programming brawn behind this project, completely rearchitecting the database list in Slim/Ember and writing an AJAX frontend for the suggested results. Shariq worked with systems librarians Emily Owens and Tom McNulty to get a Dublin Core XML file of the databases indexed and searchable in Primo. Web designer Alison Tinker consulted on look and feel and responsified the design for smaller-screen devices. 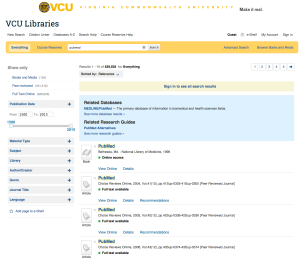 A slew of VCU librarians provided valuable feedback and QA testing. I believe this hunter-gatherer analogy for information-seeking behaviors came from Sandstrom’s An Optimal Foraging Approach to Information Seeking and Use (1994) and have heard it in multiple forms from smart librarians over the years. Re: using Google Analytics event tracking for suggested search result: sounds like there’s no easy way to define success except for the clicks? The thing about Google Analytics is, it’s not intended as log analysis. So, meaningful data can only be achieved after a certain amount of time. I’d say at least 6 months to see the trend. Thanks for the feedback, Ranti. You’re right – it’ll be longitudinal data for sure. We are also batting around the idea of figuring out how often “suggested results” are shown vs. how often they’re clicked and following the clickthrough rate over time. Nice work! I like the popular databases idea. We’re considering something similar right now – give the people what they want. I’m not sure I understand the controversy over the A-Z list – the A-Z links fulfil the same function, don’t they? One suggestion: you might want to tweak the autocomplete implementation so that when the user types an initial character, it only displays matches starting with that character. I know what you mean about the difficulty in defining success when it comes to databases. After trying different approaches to database access for a number of years, I’d say we need to acknowledge that there are larger issues with this type of library service that go beyond what we can address with interface design. I hope you’ll do a follow-up post once you’ve had time to evaluate the changes. Thank you for the suggestion on the autocomplete function. We’re going to look at how people are using it for the first few weeks before making any algorithm changes. For situations where people know a word in the title but not the first word, it may be most helpful to do a full-text search. But, time will tell.